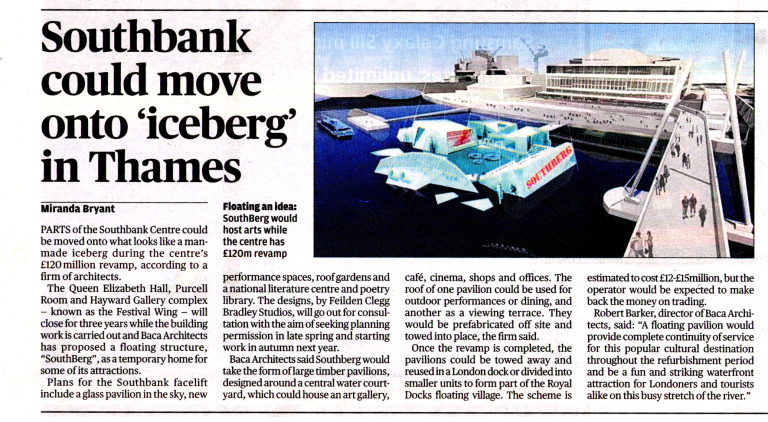 ​With the Southbank Centre set to be closed for up to three years while a £120million revamp gets underway, Baca have suggested the ‘South-Berg’ a temporary archipelago of floating pavilions which could provide a creative solution for the displaced theatres and galleries. The pavilions could be prefabricated off site and towed into place causing minimum disruption to the busy spot. And, once the construction of the new gallery is complete, the temporary buildings could be simply towed away to be re-used in one of the many underused docks in London.